Composer and violist Michael Boyman is always searching for the perfect balance of form and expression. His music often tells a story, whether from literature, visual art or personal experience, and he aims to present that story in the most vivid and emotionally intense way. Michael is the recipient of the BMI William Schuman Award and was recently featured in the 2017 Minnesota Orchestra Composer Institute. His upcoming projects include an extended chamber work for the Parhelion Trio and an orchestral work for The Chelsea Symphony to be premiered during the 2017-18 season. An alumnus of the New York Youth Symphony, Michael served as principal violist of the orchestra and was a member of Making Score, the organization’s composition program. Michael is a graduate of New York University, where he studied political science and music composition, studying privately with Justin Dello Joio. He received his Master’s Degree in Composition from the Manhattan School of Music, where he studied privately with Richard Danielpour. 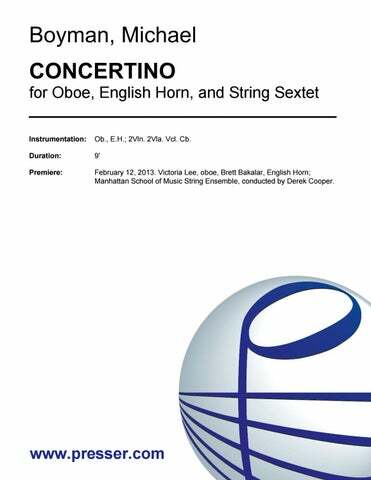 for Oboe, English Horn and String Sextet 9:00 Ob., E.H.; 2Vln. 2Vla. Vcl. Cb. 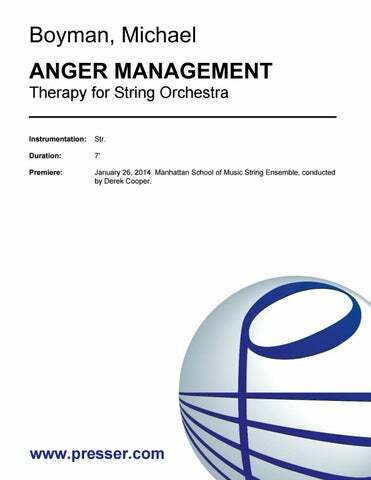 (Therapy for String Orchestra) 7:00 Str. 30:00 Solo Vla. ; 2(2nd dbl. Picc.) 2(2nd dbl. E.H.) 2(2nd dbl. B.Cl.) 2 – 4 2 3 1; Timp. 2Perc. Pno. Str. 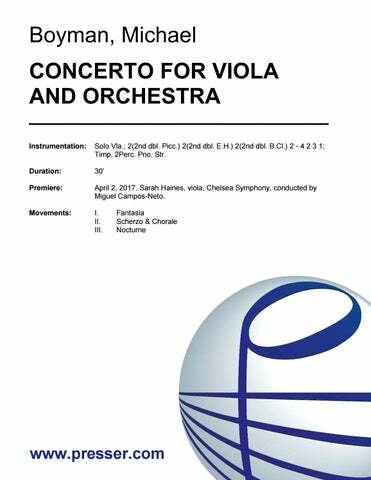 for Orchestra 15:00 3(3 dbl. Picc.) 3(E.H.) 3(3=B.Cl. dbl A.Cl.) 3(Cbsn.) – 4 3 3 1; Timp. 3Perc. Pno. Hp. Str. (High Wire Act for Orchestra) 8:00 3(3rd dbl. Picc.) 3(E.H.) 3(B.Cl.) 3(Cbsn.) – 4 3 3 1; Timp. 3Perc. Pno. Hp. Str. 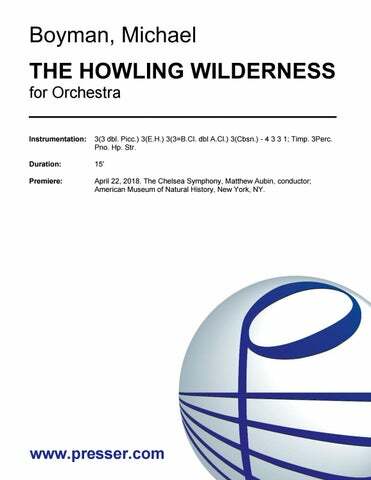 …low brass loomed large against the litheness of the viola, strings and winds, a brooding, recurrent trope. A rather cynical, dancing scherzo gave way to a boisterous neoromantic crescendo and mighty upward swirl in the coda, a succession of nocturnal motives that again referenced Dvorak at his most lustrous. This moody, mighty suite very vividly reflects our current state of unease: it would resonate powerfully with a global audience.